With all of the heat and humidity in the past week, our maintenance practices have shifted to a more defensive position. Greg wrote a tremendous blog post in 2013 that you can read here about how we can use different maintenance practices to defend the turf as best as we can through tough stretches of weather. While I have not raised mowing heights, dragging the dew off of fairways and keeping irrigation to a minimum have been our main weapons to help fight turf stress. Plant protectants are helping us as well, although they have been performing well without increasing rates. The humidity has also led to some decreased green speed, with the added moisture in the air being taken up by the plant, creating larger leaf blade surfaces. Many afternoons have the staff and I syringing the greens turf to help cool it down. When temperatures get above 85 degrees, Poa annua has difficulty photosynthesizing (making energy), and uses more energy then it can produce, causing stress damage. By applying a fine amount of water, the turf is temporarily cooled off to relieve some of that stress. This syringing creates the same effect as your skin feels if you ran quickly through a sprinkler. The below video was taken by one of our newer management tools, a thermal imaging camera. Watch the temperatures before, during, and after our assistant superintendent Matt syringes the turf on #13 green. In a matter of a couple minutes, the turf canopy goes from near 100 degrees, down to 80, and back up in the 90’s. You wouldn’t think this would do much to relieve the turf, but it helps tremendously. The picture below is 15 green taken with the thermal camera, and notice that the higher heights of turf are 10-20 degrees cooler than the green, and that the 100 degree canopy temperature on the greens turf is only cooler than the aluminum on my cart, which measured at 114 degrees. The lower height of cut on the turf, the higher the canopy temperatures can be. The great news is that the heat wave and humidity is expected to return to more manageable levels just in time for next week’s Walter O. 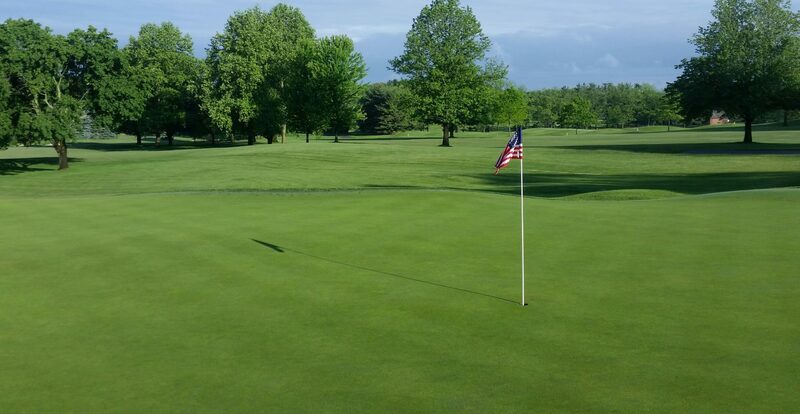 Wells Invitational, which means we will be back to normal maintenance practices and be more aggressive in achieving the conditions that you expect. As always, if you have any questions, please feel free to ask me at ryan@elconacc.com. Thanks, and have a great weekend!